Egyptian officials have been pressuring the United States to delay a referendum on South Sudanese independence, a newly-leaked US Embassy cable has revealed. In the October 2009 cable, obtained today by Al-Masry Al Youm and not yet released by WikiLeaks, Egypt draws the United States’ attention to the “fatal implications” should South Sudan choose to secede in a referendum next January. The issue of South Sudanese secession has been a contentious one for Egyptian officials as Sudan remains a key Egyptian ally in on-going disputes with Nile Basin countries over water shares. Isaias Afeworki becoming rich and Egypt mad at Ethiopia! for more and to leave comments... Have Your say!! Interview with Colonel Yitbarek Amare. Colonel Yitbarek disagreed and criticized Asgede for undermining TPLF’s history and for defaming the many heroic fighters and leaders of the TPLF. The colonel exposed many of Asgede’s false accounts, as an eye witness and as commander of TPLF regiment, who went to Sahel Eritrea to fight the Derge! How can UDJ a legal opposition party in Ethiopia allow its supporters to join hands with Dr Berhanu and Andargachew party supporters to influence Ethiopian politics in any way! Is UDJ second guessing its divorce (or was there not a divorce) from Ginbot 7 and inching to join "hule geb tigel"! A Round Table Discussion on Technology and Food Security Held at the Embassy of Ethiopia in Washington DC. Dec 01, 2010 (Eth Embassy DC)-A half-day colloquium on "Food Security and Technology" was conducted at the conference room of the Embassy of Ethiopia in Washington DC. Thursday 2nd December, 2010 (IANS)- Corporate and Minorities Affairs Minister Salman Khurshid Thursday flagged off a consignment of 16,000 day-old chicks to Ethiopia as part of a programme to introduce and breed superior quality poultry in the African nation. We hope this will not affect in a negative way the indigenous chickens that have survived for millennium in Ethiopia, come rain or shine! Addis Ababa, December 1 (WIC) - The first India-Ethiopia Joint Ministerial Commission Meeting is taking place in New Delhi, India on December 1 and 2, 2010. The Ethiopian delegation is being led by Hailemariam Desalegn, Deputy Prime Minister and Foreign Minister of Ethiopia. The delegation will also have two State Ministers, namely, Ahmed Tusa, State Minister for Trade and Ahmed Shide, State Minister for Finance and Economic Development. The wikileaks website has just released more than 250, 000 diplomatic... It includes a cable from American Ambassador in Eritrea who told Washington that Eritrean leaders where either lying or ignorant when they denied supporting al Shabaab. Note:The dysfunctional opposition web outlets are quoting wikileaks for their make believe story about the Ethiopian government. They may think wikileak is a jungle hard to navigate because of its huge database, regardless, we call upon them to give links for their story in wikileaks like we have done with the Eritrean govt above! Where is the beef Addisneger? What Would You Sacrifice To Give Ethiopia A Better Life To Live? President Isaias conjures up another anti-Ethiopian ‘Front’ –yet again! CEO Girma Wake honored at Boeing 777 Delivery Dinner. TDA-NA DC Chapter is hosting a grand fund raising event to support the campaign of transformation for improving the quality of education in Tigray, Ethiopia. Place:-Temple Shalom 8401 Grubb Rd Chevy Chase, MD, 20815. 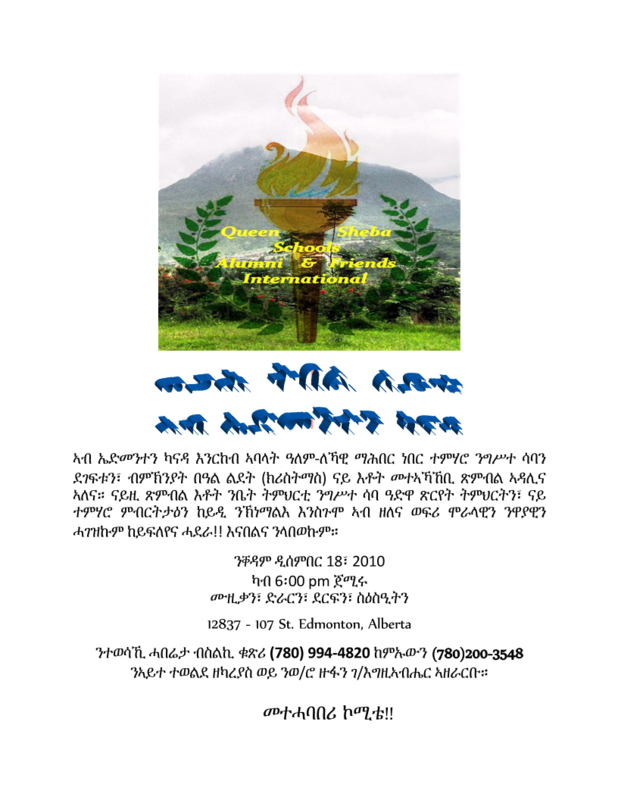 Queen Sheba Edmonton Chapter Invites You!! !